Spicy Treats: Chickpeas Methi Masala BrownRice / Kala Channa Methi Brown Rice - Healthy Brown Rice Recipes! 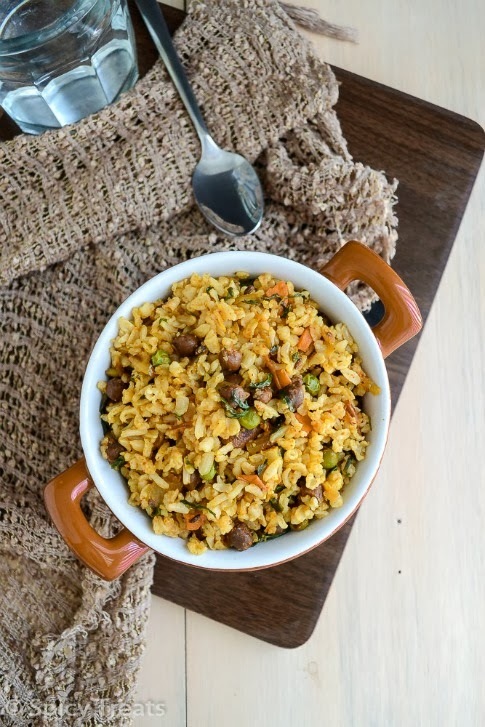 Chickpeas Methi Masala BrownRice / Kala Channa Methi Brown Rice - Healthy Brown Rice Recipes! Today's recipe is simple yet perfect recipe for people who diet and looking for low calorie, high fiber n healthy recipes. You can diet and still enjoy yummy and delicious recipes by adding high fiber or whole grain in your every day meal. I regularly add brown rice instead of white rice, but some times get bored to eat as such with side dish. So sometimes will make one pot meal with addition of vegetables and spices. 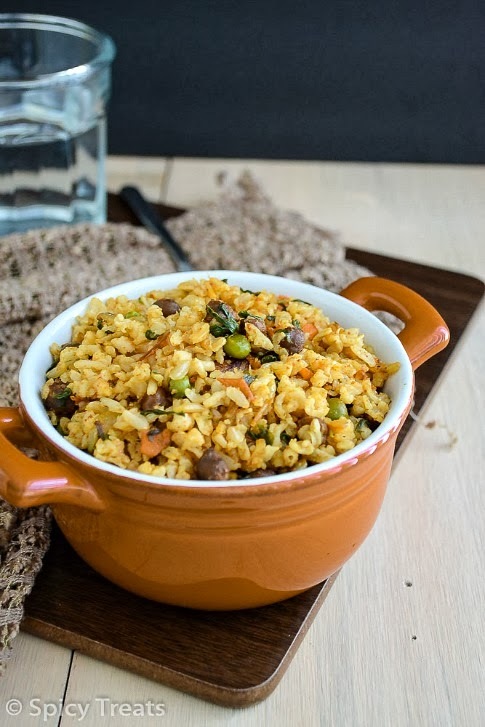 This chickpeas methi masala brown rice is one such easy n filling recipe. I used 1/4 cup or less chickpeas, methi, few carrots and peas little spices and put everything together tossed. It is so simple and sounds delicious right? Yeah its healthy and filling too. Here you go..
Soak Brown Basmati rice for at least 3-4 hours this helps to cook rice fast takes only 20 minutes or less. Once cooked transfer to a plate and cool for a while. Then heat oil in a pan, add the tempering ingredients wait till it splutter. And add onion and ginger saute till onion turns translucent and add tomatoes and saute till soft n mushy. Now add cooked channa, fresh methi, carrots and peas stir it and add turmeric powder and lil' salt and stir fry for a minute. Cook covered for 2 minutes then add chilli and garam masala powder and stir well. After that add cooked brown rice and stir fry with the masala for 2 minutes. That's it...Healthy and delicious Chickpeas Methi Masala Brown Rice ready. Serve with plain beaten yogurt/curd. the same recipe can be made using regular basmati rice/cooking rice also. 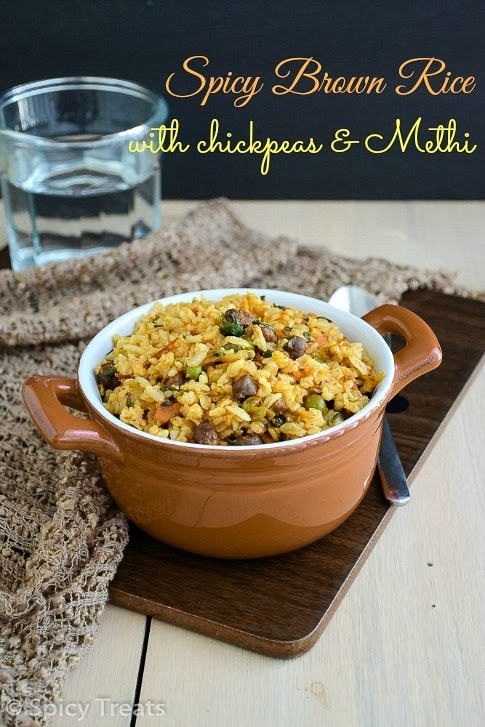 Adding methi doesn't give bitterness to the rice, but if you want you can skip methi leaves or replace with spinach also. I used black chickpeas u can also use kabuli channa/yellow one or any desired legume. Wow what a tempting bowl. All goodness in one bowl. What a delicious an flavourful rice. healthy & delicious combination dear,looks yumm with raitha..love the colors,amazing clicks!! Healthy and delicious rice. yummyy! Such a super filling and healthy one pot meal, prefect satisfying dish for dieting peoples. I love all the healthy ingredients you incorporated in there,nice recipe and stunning pics! Deliciously healthy is all I am able to utter after seeing this creation. Wow! Well done! Looks colorful and healthy. I like such complete meal. GEETA: 1/4 cup fresh Methi leaves would translate to what if using fenugreek seed? do you have a glossary of ingredients on SPICY TREATS? thanks for your delicious food. if possible u can add dried methi leaves. But you can use fenugreek seeds but add only 1/4 tsp while tempering.